An Action Replay subscription is essentially a list or compilation of cheat codes for a game or several games. You may find several code lists around the that you would like to add to your Action Replay. This tutorial will show you how to add them to your Code Manager to put onto your Action Replay. First, open the Action Replay Code Manager. Click on the Add A New Subscription button in the top right corner, which looks like a piece of paper with a + on it (blue circle in the picture). Either copy and paste or type in the name of the subscription. 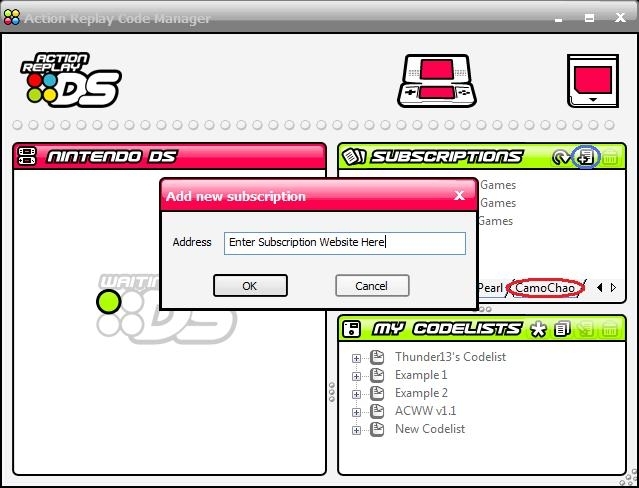 Click on the name of the subscription (red oval in the picture). Then just like the Codejunkies subscription, open the code list by clicking on it, then click on the game you want the codes for. Drag and drop the game onto the left side where your DS is connected, and it will ask if you wish to overwrite the game, click yes.